I've been pretty vocal about my adoration for all things Mezco Mez-itz, recently I was able to briefly speak with one of the original sculptors of the line. He started with the company back in 2000 and had a hand in crafting some of the coolest collectibles Mezco had to offer! 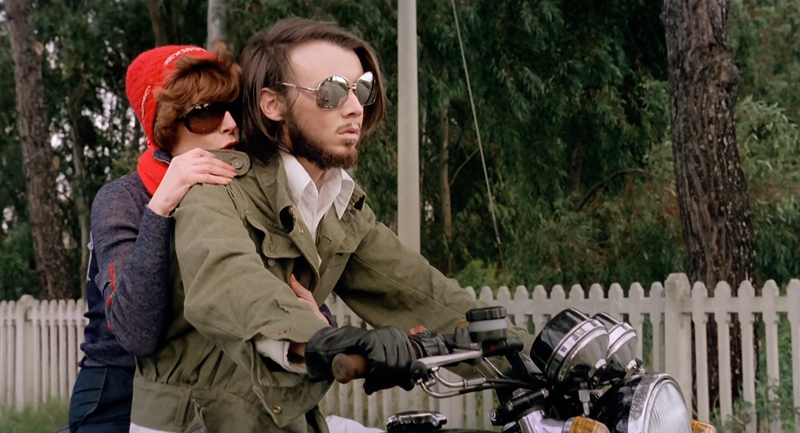 Raro Video continues their onslaught of releasing obscure Euro-cinema. This time they're giving fans Alberto Cavallone 's Blue Movie, which happens to be the first official US release of this extremly odd film. After being sexually assaulted Silvia (Danielle Dugas) shacks up with an amatuer photographer named Claudio (Claude Maran). Unfortunately for her Claudio is also a bit of a sociopath. That's not to say Silvia is exactly sane, the poor lady is haunted by macabre visions. While Claudio offers the woman safety, he eventually locks her inside of his apartment and begins treating her like a caged animal. What happens when the man behind Eaten Alive and Nightmare City sets his sights on creating a Poliziotteschi film? Oh, only one of the most wildly violent and misogynistic movies ever pressed to a blu-ray disc, that's what. 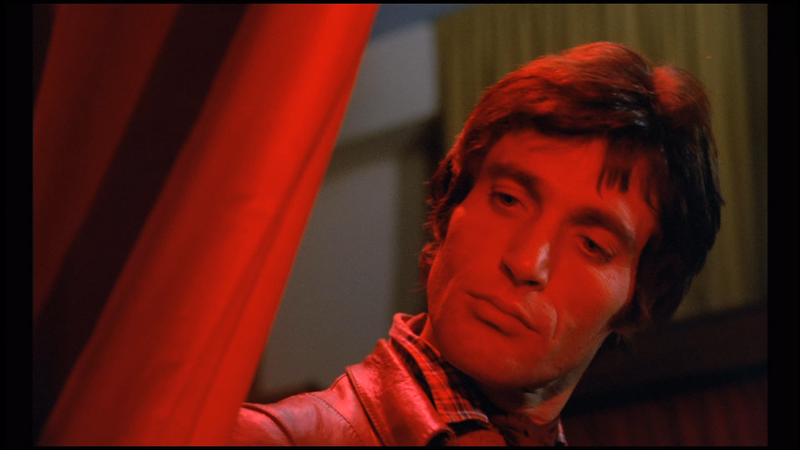 Salvatore (Antonio Sabato) is a full time produce vendor and a part time criminal. When he's not hawking fruit to unsuspecting customers he's moonlighting as a pimp and making a pretty nice living for himself in doing so. That is until crime boss Roger Daverty (Philippe Leroy) shows up. Arrow Video is turning five! I'm sure you're probably asking yourself "how does a label like Arrow Video celebrate a Birthday?" By releasing five limited edition steelbooks, that's how! 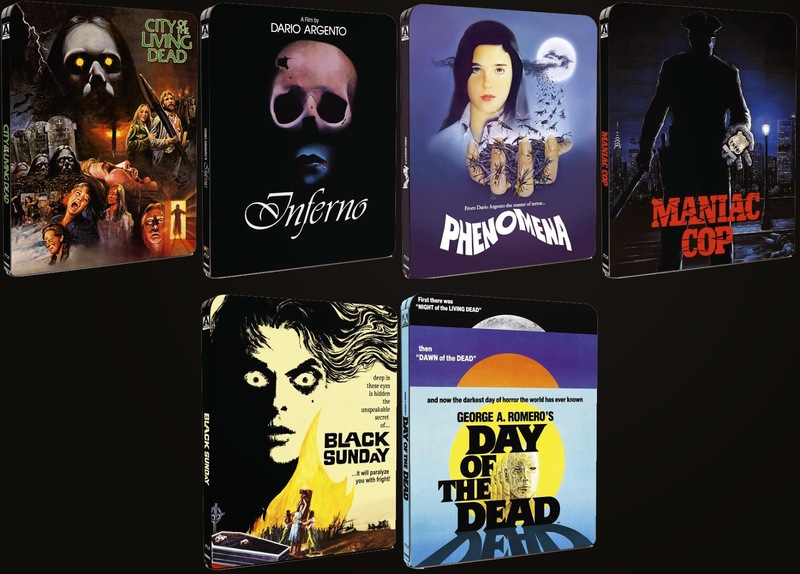 In conjunction with the UK retailer Zavvi, Arrow is giving Maniac Cop, City of the Living Dead, Day of the Dead, Black Sunday, Inferno, and Phenomena the steelbook treatment. Each of these releases are currently available for pre-order over at Zavvi. But wait, there's more! One lucky consumer will find a golden ticket stashed inside one of these Steelbooks. The owner of said ticket will then be entitled to receive the entire back catolog of Arrow Video releases along with everything the company releases in 2014. Pretty cool, eh? Below you'll find pictures of the artwork along with each film's respective release dates. This year the big green famous monster officially turned 60. 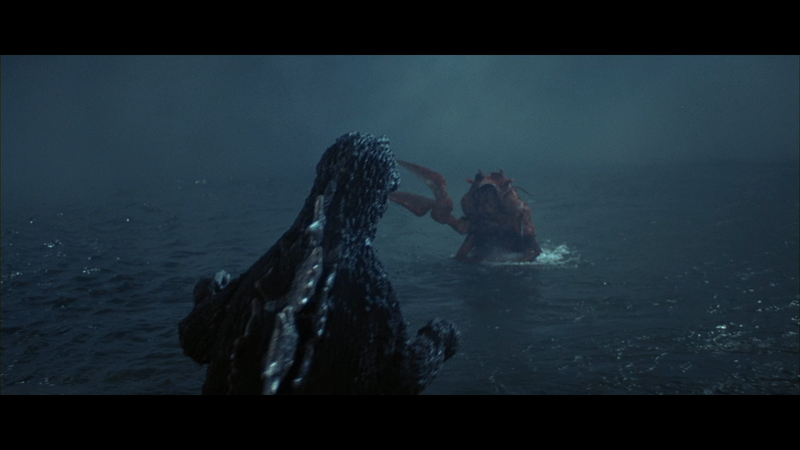 Rather than retire like most folks that are rounding out six decades, the creature decided to travel to California and have it out with two other ancient creatures in Legendary Picture's Godzilla. To celebrate this momentous occasion a number of labels are giving some of the more popular Toho Godzilla films the high definition treatment. Today we will be discussing three blu-ray releases from Kraken films (A Subsidiary of Section 23), each of these high definition releases are moderately priced and should properly whet your appetite for the monster mayhem featured in the 2014 film. Oh, and if you haven't seen said film....WHAT ARE YOU WAITING FOR!? It's been waaaaay too long since I've held a contest! Want to win everything pictured below? Head on over to the Cannibal Reviews facebook page, like the page and share the pinned contest post. By liking the page and sharing the post you will receive an entry into the contest. The contest starts today (May 23rd) and will run until June 27th. On the June 28th two random names will be drawn, the first will get the prize pack pictured above while the second will receive a signed blu-ray of Chromeskull. More images and details after the break! 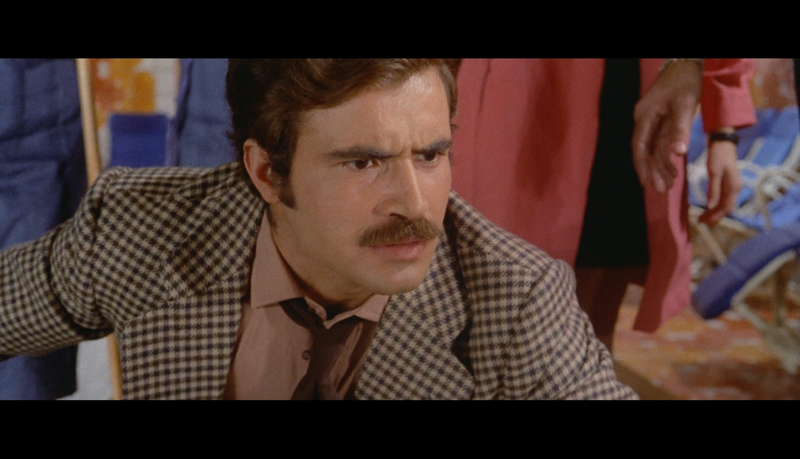 1975's Hallucination Strip was the first and last film Lucio Marcaccini would helm. Understandably, as the film feels a bit convoluted; ripe with social commentary, subplots that go no where, and a few forgettable characters. With all of that said, I found it oddly enjoyable. Unfortunately the Lucio passed away in the early 80's, making a commentary track a bit hard to get (Ouija board anyone?) Too bad as I'm sure he'd have more than a few interesting stories behind the troubled production. A few weeks back I was lucky enough to be the 131st person to purchase Mondo's limited edition GLOW IN THE DARK Frankenstein Meets the Wolf Man print. 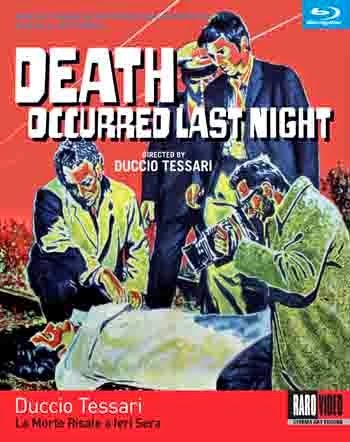 Death Occurred Last Night is the latest in a slew of Euro genre pictures Raro will be unleashing upon film fans over the next few months. A lonely widower (Amanzio; Raf Vallone) enlists the help of two detectives to track down his missing mentally disabled daughter (Donatella; Gillian Bray). Donetella is a voluptuous twenty-something with the mind of a child while Amanzio is the typical overbearing father. 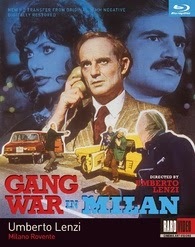 The two detectives (Lambert; Frank Wolff and Mascaranti; Gabriele Tinti) become entwined in this mystery after the local police department prove incompetent in the matter. Another Texas Frightmare Weekend is in the books and I have to say 2014 was one of the strongest years for the convention. Partnering with Mondo (who can say no to exclusive posters!?) and the Alamo Drafthouse was a great move and I hope those relationships continue into 2015. If getting the chance to go to Texas Frightmare Weekend wasn't exciting enough, I actually scored tickets to a screening of Dawn of the Dead with George Romero, Tom Savini, David Emge, and Scott Reiniger in attendance. Words cannot exactly describe how cool this event was; Thankfully I did have a camera on hand so I'll let the video do the talkin' for me. The video does cut out before the last question, but there's a lot of ground covered and some pretty interesting stuff discussed throughout the Q & A so it's well worth the watch if you're a fan of the film. After a few long weeks I'm finally ready to head down to the Texas Frightmare Weekend! I sincerely apologize for the lack of updates over the past few weeks. I had a few more posts lined up for this week but my computer had other plans, unfortunately most of my saved images and videos are now gone. Thankfully I'm now the owner of a faster PC which will make creating new content much easier so I guess there's a bit of silver lining. Anyhow, TFW related updates and coverage will start here on Sunday! If you happen to make your way to Cannibal Reviews thanks to one of my TFW flyers be sure to let me know!